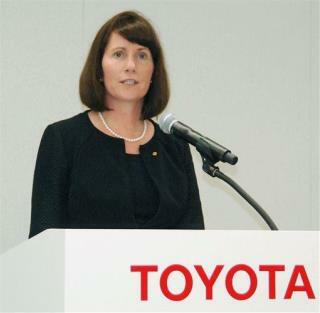 (Newser) – Toyota’s first senior female executive was arrested in Japan yesterday after customs officials allegedly found 57 Oxycodone tablets in a package mailed to her from the US. A package labeled "necklaces" was sent to Julie Hamp from the United States on June 8, and arrived in Japan on June 11, according to the Japan Times. Inside were several boxes with necklaces and pendants, and dozens of pills placed at the bottom, Reuters reports; the AP picks up local media reports that said the drugs were tucked in various parts of a jewelry box and adds that the package was sent by Hamp. According to police, Hamp "did not believe she had imported narcotics when she was arrested." Toyota is rallying around its head of public relations, expressing confidence that "the investigation will reveal that Ms. Julie Hamp had no intention to violate the law." What kind of impact does TPA or TPP have in this mess, if any?